Andy: Smells a lot like a watermellon Jolly Rancher. I don’t really like it as the sole flavor in a drink, but it does have a nice watermelon taste. 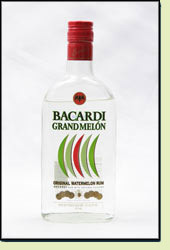 Might be good in a watermelon-tini! Adrian: This one has a really delightful flavor and is even good straight. Would make a great shot by itself, or mixed with pineapple juice. A little too sweet for an entire drink.